One can sometimes doubt the good faith of the laboratories when presenting their clinical results. Recently, we have seen some striking examples in the presentation of the results of GALMED for ARAMCHOL with a communication that is at least optimistic regarding the results. I do not think that the clinical results presented in NASH can be taken as definitive, their reading can not be black or white because the field of metabolic diseases, and that of NASH in particular, is anything but black and white. 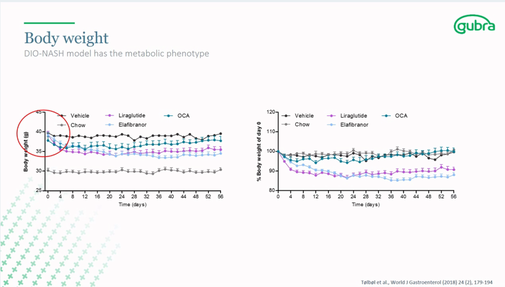 The complexity of metabolic mechanisms is such, that few things can tip a treatment from success to failure and vice versa. We have seen examples of molecules that have experienced an apparent failure of their clinical study in NASH and yet have attracted great interest from researchers and laboratories that have analyzed the results much more finely and identified a promising mechanism for action or a subpopulation where the drug was very effective. This is how we saw the major takeover of Tobira by Allergan despite an apparent failure of CENICRIVIROC in NASH but some hopes in fibrosis. We could also mention the GILEAD SELONSERTIB drug or even the GALECTIN GR-MD-02. The ELAFIBRANOR is not left out, the apparent failure of the results of its phase 2b sticks to its skin and keep away many investors. Despite the fine analysis of the results published in the journal Gastroenterology, a year later, that clearly presents the study as a success, despite the fact that by applying the new definition of reversion of NASH proposed by the FDA after design of the study, phase 2b of ELAFIBRANOR is a success without any statistical reprocessing, nothing helps, we continue to read 3 years after articles of analysts confined themselves to mention the failure of GENFIT’s phase 2b . Objectively, we can question the behavior of investors and what leads them to remain cautious about the value. A first reason is probably that majority of analysts operating in the global Biotech market are North American. The latter, with some exceptions, are limited to studying the values that are listed on the NASDAQ, which is why we regularly read analysis of the NASH market potential which explains us that the molecules at the top of the competition are those of GILEAD, INTERCPT, MADRIGAL, ALLERGAN and even VIKING, without even mentioning GENFIT. What an advantage to quote a company that is not listed on NASDAQ ?, impossible to seriously speculate on it, as the small US investors will not be able to buy it . It is disturbing, however, to read detailed financial analyzes with an alleged scientific basis that deliberately discard one of the leading molecules in this market, simply because one can not easily speculate financially with. There is here a form of intellectual swindle that does not seem to shock many people. One of the most telling images of recent months is a slide from a COWEN conference and relayed on Twitter. 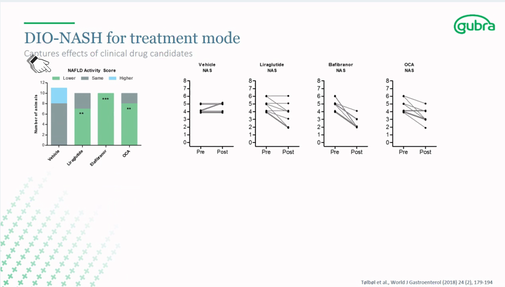 This presentation shows the gap between the assessment of drug candidates by the scientific community and the audience that was mainly composed of financial analysts and investors. The biggest divergence in opinions is clearly on ELAFIBRANOR! The few knowledgeable institutional investors with whom I was able to share, recognize this bias, but they also use an argument that did not leave me indifferent because I find it particularly misleading in view of the reaction of investors to the latest ads published by some laboratories. They express doubt about the objectivity of some institutional presentations on ELAFIBRANOR, suggesting that society would only highlight the positive results of the molecule by ignoring areas of ambiguity or ambiguous results. They say they prefer to wait for the results of phase 3 before having a clear opinion on the ELAFIBRANOR. It is obvious that all the laboratories highlight the strengths of their molecules and do not spend their time pointing out their gray areas, that's why to get a clear idea it is always better go read the independent scientific studies as the institutional presentations of the laboratories. But with regard to the latest presentations of laboratories in NASH it seems fallacious to limit this phenomenon to GENFIT, because, on that point, there is something to say about all the presentations of laboratories in recent months. Some will point out that scientific studies are not really independent, researchers are often directly or indirectly paid by the laboratories and rarely take lapidary positions on the molecules studied, moreover, the laboratories usually only mention 'independent' studies that benefit them, it is good war strategy. But now, there is a way to avoid these biases and to get a realistic opinion on the effects of a drug candidate, it is to carefully examine the comparative studies published by competing laboratories! We cannot suspect that they would highlight the advantages of a competing molecule; these studies therefore allow having an unbiased vision of the real results without the deforming prism of the selection of the laboratory promoting its own molecule. The first lessons of the analysis of the comparative studies are undoubtedly the choice of the other molecules retained by the laboratory wanting to compare its results with the potential competition. 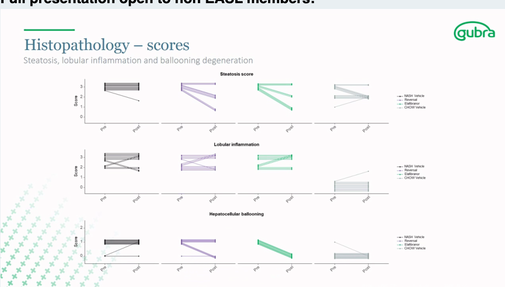 They do not do these studies to please financial analysts by drawing in a panel distorted by market considerations, but, for their analysis to be considered relevant, they must compare themselves with the molecules considered as the treatment reference in the scientific community. 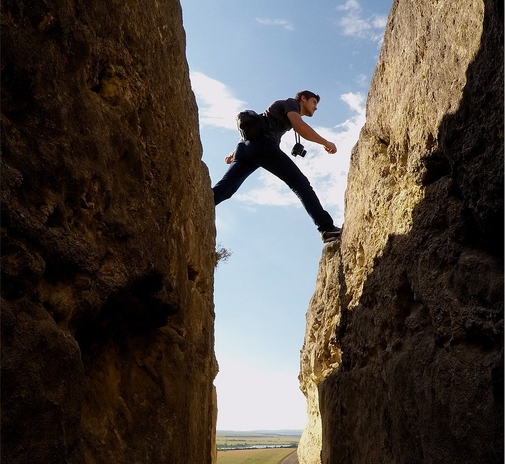 This is where we find the biggest gap between scientific specialists and financial analysts and investors. As an example, the ELAFIBRANOR is considered one of the reference treatments (when it is not the only one) in almost all the comparative studies presented by the laboratories last year and is however almost ignored in the majority of investor’s comparative analysis. The second lesson that can be drawn from these comparative studies carried out by the competing laboratories is, of course, the unbiased presentation of the results presented. While remaining in the logic mentioned above we can possibly remain cautious about the choice of results presented by a laboratory on its own molecule, but we do not really see what would be his interest to highlight the results of a competitor, it would rather logical to see the reverse. And on this point, comparative analyzes show results far removed from investors' resentment. I will use as an example the results of two recent studies presented in conference or on a posters in a major NASH congress. 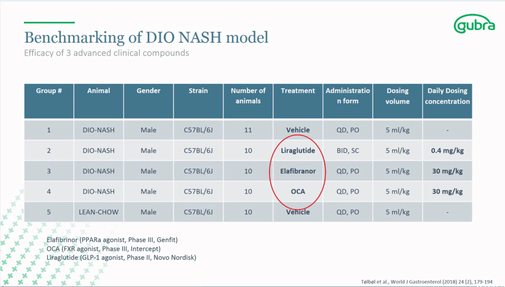 The first presentation is interesting because it does not come from a laboratory proposing a molecule against NASH but from a laboratory (GUBRA) offering a variety of mice whose behavior is close to humans on this pathology. It comes from a study published in January 2018. 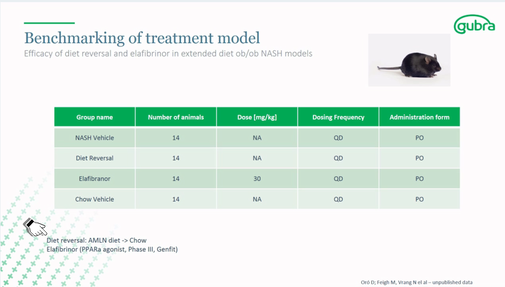 To validate their murine model, they began by benchmarking molecules that seemed consensual to the scientist community for the treatment of NASH. Remember that their goal is above all to convince scientists to use their mice in their trials, investors's opinion does not matter to them in this demonstration. They therefore performed tests comparing the results on 5 trial arms and had no interest in demonstrating the efficacy of one treatment over another. Let's take a look at the first results on weight loss! What do you notice? ELAFIBRANOR is by far the most effective! Once again, ELAFIBRANOR is the only one to lower the score of its entire cohort! They logically continue their analysis by conducting a more advanced study on their mouse and this time by retaining only one active drug, the ELAFIBRANOR! compared to a hypo-caloric diet. 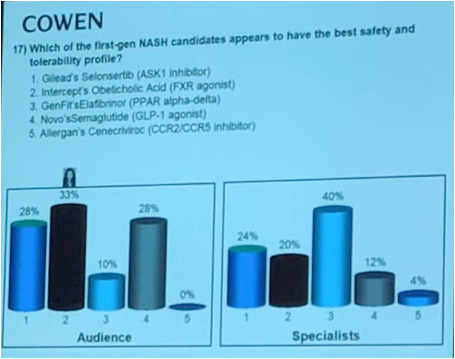 And the results are still striking, the ELAFIBRANOR is by far the most effective, especially on a factor recognized as essential in NASH, ballooning! I quote this study as an example because it is very recent and its context excludes any wish to highlight a particular molecule. This is a factual preclinical study, independent of laboratories's influences. The second study I present here is a poster from the company POXEL which is developing a compound against NASH, the PXL770. 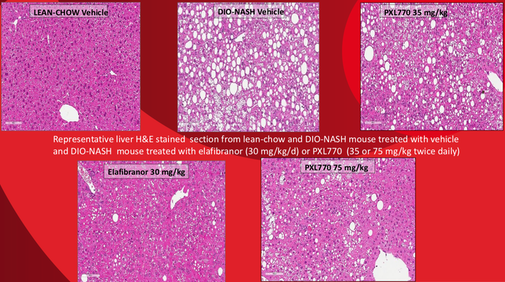 And the photo of the biopsy is more than speaking, there is almost a total reversion of the NASH with ELAFIBRANOR, it looks like the biopsy photo of the mouse without NASH. Let us recall again that this poster was presented by POXEL and that GENFIT did not have the opportunity to embellish its own results. Financial analysts who pride themselves on knowing how to read between the lines of laboratory communication should take the time to take inspiration from this method to build an objective opinion. They may continue to ignore one of NASH's potential reference treatments, the scientific community is not in tune with them and this big gap with scientific reality will surely catch up with them. Notice that I am neither a physician nor a biologist or financial analyst, my point of view is only that of an enlightened amateur, so it must be taken for what it is, a questionable point of view!